The term ‘skin peel’ doesn’t sound the nicest, does it? But it’s not as scary as you think, especially when Vichy is involved! Skin peels are one of the oldest cosmetic procedures performed (it’s even rumoured that Queen Cleopatra used to bathe in sour milk, which contains the AHA lactic acid). The reason as to why is very straight-forward; skin peeling treatments promote radiance by removing dead skin cells from the skin’s surface. This action reveals a new layer of skin, which leaves the complexion brighter, with a more youthful appearance. Lucky for us though, we no longer have to visit a physician or pay through the roof to experience the rejuvenating benefits of a peel (or bathe in sour milk), we just have to browse the Escentual French Pharmacy category! Earlier this year, Vichy released Vichy Idealia Peeling, a targeted night treatment that’s set to change how we all think about skin peels. Not only is the formula suitable (and formulated) for sensitive skin, it’s also extremely easy to use – all you have to do is swipe, then sleep! Vichy Idealia Peeling falls into the exfoliator category, specifically chemical exfoliators (more on this here). This means that it works to refine the skin’s texture by removing dead skin cells from the surface of the skin without scrubbing. It does this thanks to a jam-packed formula of gentle peeling and natural active ingredients, which smooth fine lines and skin texture, improve radiance and give the complexion a natural glow. Blueberry Polyphenols: Blueberry Polyphenol is an antioxidant that helps protect against the effects of ageing and oxidative stress. Its powerful antioxidant power can help reduce inflammation and neutralise free radicals. Kombucha Tea Extract: Obtained from black tea, Kombucha is known as the ‘tea of mortality’. Rich in antioxidants and probiotics, Kombucha promotes skin health, re-energizing and detoxifying the complexion for restored youth. Glycolic Acid: Derived from sugarcane, glycolic acid is the smallest molecule of the Alpha Hydroxy Acid group (AHAs). Idealia Peeling contains 4% Glycolic Acid, which gently exfoliates the skin, helping to improve texture and radiance. Hepes: Also known for its exfoliating benefits, Hepes is an active ingredient that stimulates the skin’s own natural exfoliation process and can be found at a 5% concentration in the Idealia Peeling formula. Vichy Mineralising Thermal Water: Clinically proven to strengthen the skin’s barrier function, Vichy Mineralising Thermal Water is enriched with 14 minerals and helps to accelerate surface skin cell renewal, while soothing and calming the skin. Q1: How is it suitable for sensitive skin? Vichy Idealia Peeling has been tested by dermatologists under real life conditions and on sensitive skin, to ensure that they’re not only suitable but also effective on sensitive skin. Vichy have also added their mineral-rich water to the formula, which helps to soothe and calm after application. Q2: Can I use it alongside other peeling treatments? 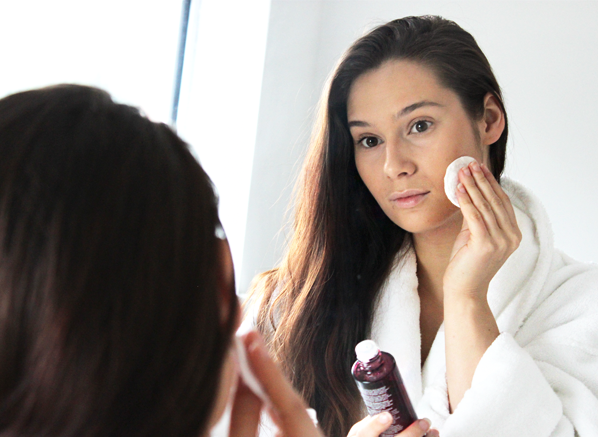 When it comes to your skin, you should never over do it. 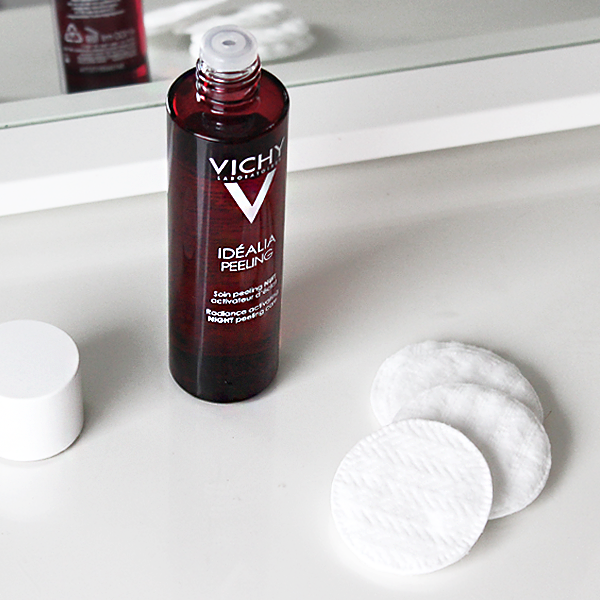 If you’re adding Vichy Idealia Peeling into your routine you won’t need another peeling treatment. Idealia Peeling was created for daily use (begin 1-2 times a week if you’re prone to sensitivity to build tolerance), and therefore will continually remove dead skin cells and enhance radiance. Q3: What’s the texture like? The overnight treatment has a liquid texture, which is as light as water. Free from exfoliating particles, the texture will not rub or pull the skin. Instead, it will just easily sweep across your complexion. Q4: When will I notice results? The morning after! The Idealia Peeling formula will give your skin a noticeable glow the day after use, and continued use will improve the skin’s texture, minimise the appearance of fine lines and wrinkles, and enhance radiance. Q5: How do I use it? After cleansing your skin (before the application of other skincare), apply a few drops of Idealia Peeling to a cotton pad. Spread evenly across the face. There’s no need to rinse, just sleep and let it work its magic! It has been only 2 weeks since I am using it, but I can already see that my skin is in much softer, not sure about my forehead wrinkles as yet. Cream smells gorgeous, absorbs quickly and my face looks radiant :) Defiantly worth a try! This entry was posted on Friday, April 21st, 2017 at 1:09 pm and is filed under New products, Skincare, Spotlight On, Tried & Tested. You can follow any responses to this entry through the RSS 2.0 feed. You can skip to the end and leave a response. Pinging is currently not allowed.